It has become increasingly obvious that collecting healthcare data from patients is imperative to ensuring that they receive the best care possible. Healthcare facilities, Biotech companies, pharmaceutical distributors, pharmacies, and healthcare providers alike have a responsibility to provide the care that patients both demand and deserve. Collecting data through the assistance of patients is the most efficient and reliable way to gain an awareness of those unspoken demands, and be able to move forward with constructive communication and treatment options. Communication in healthcare has long been an issue plaguing companies who handle patients and their records. Miscommunication between all parties involved in medical decisions can lead at its best to patient dissatisfaction, and at its worst to improper treatment methods, incorrect medication prescriptions, and even death. 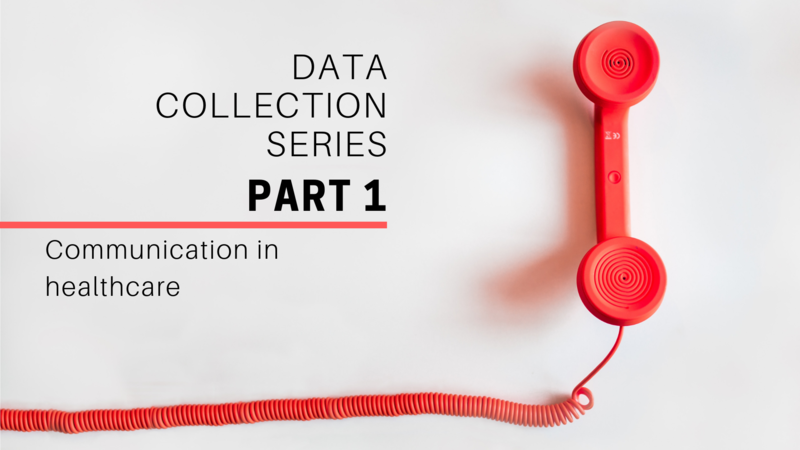 To address this issue of a lack of communication in healthcare, a few national surveys were recently conducted to bring to light both the issues that patients feel go unrecognized, and the possibilities of future trends in the healthcare industry. According to the CPR, 80% of patients still communicate with their doctor’s office via telephone when scheduling appointments. However, when it comes to accessing health data, that number falls to 22%, with patients choosing to discuss their information rather in person or through online portals, percentages at 41 and 35 respectively. This suggests an increasing trend towards the use of more modern methods of technology to access health records. When it comes to asking health insurance providers questions about a patient’s bill, coverage, or even health issues, it is increasingly obvious that American patients desire a more modern way of communication rather than through the phone as is currently done 83% of the time. In fact, nearly three quarters of patients (72%) view it as important that their health insurance provider uses modern tools for communicating (e.g., web portal, live chat/instant message, two-way video). These health records, otherwise known as Electronic Medical Records (EMRs), are believed by most patients to either help patient care a great deal (42%) or help patient care somewhat (43%). When the PFPS asked the survey takers if they think all doctors should provide access to their EMRs, the answer was overwhelmingly “Yes” at 82%. Currently, the majority of patients (60%) rely on their doctor to keep track of their EMRs. Only 29% of patients even have access to an online portal. When asked, “Do you think EMRs will improve the quality of healthcare in general?” respondents answered “Yes” at a rate of 74%. Patients definitely have concerns about the future of healthcare. 89% of respondents say they are concerned about how much healthcare costs will affect them in the future, and 79% agree that while the Affordable Care Act was not perfect, healthcare reform was needed. While 71% of patients surveyed don’t currently have any debt due to medical costs, 75% are concerned with their ability to pay for any medical treatment if they were to get sick or injured. These rising healthcare costs are attributed at 56% to the cost of pharmaceuticals/cost of prescription drugs. Pharmaceutical companies are playing an increasing role in patient outcomes. 88% of patients agreed with the statement that “Pharmaceutical companies and the way they price drugs is a main reason for high healthcare costs”. Nearly three out of four patients (73%) had been prescribed medication in the 12 months leading up to the CPR survey. However, when choosing who to go to for their medication questions, patients choose their pharmacist or doctor 73% of the time over the pharmaceutical companies. Improving the patient experience is becoming of greater concern to all involved in the healthcare industry. Patients desire genuine, constructive assistance. In fact, 72% of patients agreed with the statement “I would choose pharmaceutical drugs from a pharmaceutical company that is engaged in my outcome over one that is not”. This is evidence of an increasing need for modern, consistent communication and support methods offered by healthcare industry professionals towards their patients. Additionally, 60% of patients (and 70% of millennial patients) would be open to virtual support service options (e.g., video conference call) with pharmaceutical companies to help them understand their medications. Patients are willing to ask for specific medications by name if pharmaceutical companies would be willing to improve their patient experience. Increasingly, millennials are the ones paying the most attention to pharmaceutical companies’ concern with their welfare. When provided a list of options answering the question “Which of the following offerings would make you more willing to ask your healthcare provider for a specific brand of medication?” 37% indicated willingness as long as the company offered some sort of online patient portal for support and advice, 28% indicated willingness as long as there were an offered online community with other individuals taking the medication, and 20% indicated willingness as long as the company offered some sort of virtual assistance (e.g., two-way video conferencing, live chat). No matter the chosen method used to improve the patient experience, 91% of patients agree that all healthcare stakeholders must work together to address challenges that make the current system difficult to understand. They believe that physicians and patients create a true partnership representing the most essential element of a quality healthcare system, that the physicians voice must be front and center in discussions around healthcare access, cost and quality, and that physicians are patient advocates and play a vital part in providing quality and affordable healthcare. The challenge comes when considering patient privacy and how can data collection avoid issues surrounding patients privacy.